Scrape them: If your child went No. 2 in the diaper, you have to dispose of it before you wash. If the waste isn’t solid enough to dump into the toilet, you’ll have to use a scraper to remove it adequately enough so that washing can follow. After the diaper has been scraped, remove the cloth insert and place it into a soiled diaper pail. 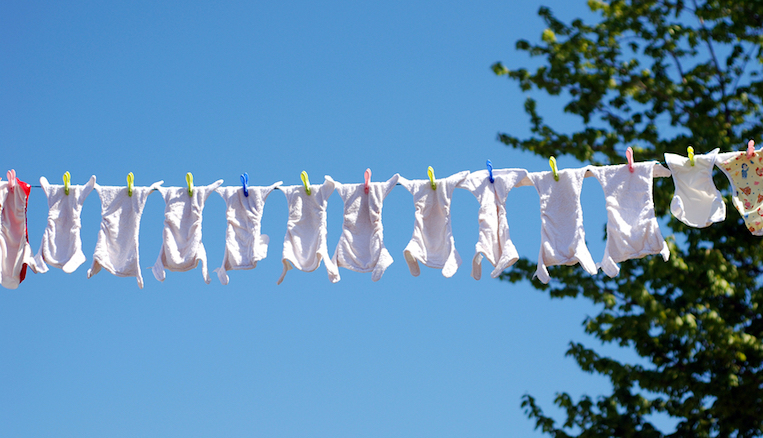 You should be washing cloth diapers every two to three days, or when the pail is full. Generally, you don’t want to wash more than 18 diapers at once. Start by dumping the diaper pail into the washing machine and setting the washer to a cold rinse. After the cold rinse, add detergent (check with the diaper maker to see what they recommend) and set the water temperature to hot. Once the wash load is complete, it’s time to dry. Follow the diaper maker’s recommendations when it comes to drying the diapers. Depending on the maker, drying may consist of machine drying, hang drying or some sort of combination of each. Cloth diapers are becoming increasingly popular as an alternative to the conventional disposable ones, but it’s important to know how to properly care for them to get the most out of them.